We welcome the first city from the welcome app Germany Rhineland-Palatinate with the State capital Mainz. The everyday helper is Arabic, English, French, German Russian and Farsi in English (Persian) available. In many categories of users of offices, authorities, social institutions, schools, leisure activities, as well as about life in Germany information. The local and regional reference distinguishes the welcome app with contacts on the spot – for better understanding and cooperation in everyday life. 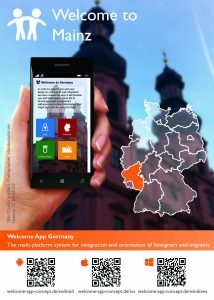 We are particularly pleased that that now already nine city include the welcome app Germany with Mainz. Our goal is to integrate all city – please help!